Large, white snowflakes are slowly falling to the ground in front of your window and an ice-cold winter wind rustles through the trees. The perfect time for brewing a cup of this well-thought-through festivity blend which will bring a warm touch of harmony into your home. The fresh scent of juicy orange in combination with a chocolate-marzipan flavour is underlined by a fine optic of orange slices and cinnamon rods. Pull up your blanket and make yourself comfortable in front of the fireplace, close your eyes and enjoy a cup of this festive creation. 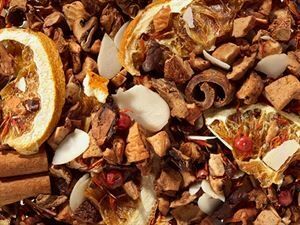 Ingredients: apple pieces, cocoa peel, planed almonds, orange slices, cinnamon rods, flavouring, pink peppercorns, safflower. ingredients: apple pieces, broken cocoa bits, sliced almonds, orange slices, cinnamon rods, flavouring, pink peppercorns, safflower, Important notice: always brew with boiling water and let infuse for at least 5-10 minutes! This way, you will receive a safe food!